The European Society for Engineering Education (SEFI), founded in 1973, is the largest European network of higher engineering institutions and individuals involved in engineering education. The SEFI mission is to contribute to the development and improvement of engineering education in Europe. The Leonardo da Vinci Medal, instituted in 1983, is the highest distinction that SEFI bestows. It is awarded to living persons who have made an outstanding contribution of international significance to engineering education. 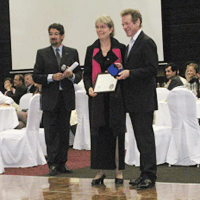 On 21 September, in a ceremony at the Joint International IGIP-SEFI Annual Conference in Trnava, Slovakia, UNU Rector Konrad Osterwalder was presented with the 2010 Leonardo da Vinci Medal. The award recognizes both his research, his teaching and his leadership roles (including assistant and associate professor for mathematical physics at Harvard University; professor for mathematical physics at ETH Zurich; rector of ETH; member and chair of university councils in Switzerland, Germany, France and Italy; and rector of UNU). Leonardo da Vinci Medal 2010 – IGIP-SEFI 2010.